Easy to bait, set, and release. Unique high tensile wire mesh. 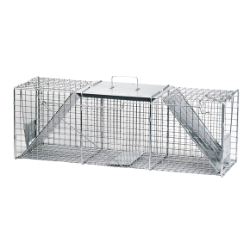 Steel reinforced for long life and maximum resistance to animal damage. Smoothed inside edges for the protection of the animal. Proven efficacy derived from extensive field testing. Spring loaded or gravity action doors with sensitive triggers ensure quick secure catch.